The St. Regis Sanya Yalong Bay Resort is pleased to announce the appointment of the Executive Team that will spearhead the opening of South China’s first St. Regis resort in November, 2011. The executive team at the St. Regis Sanya Yalong Bay Resort will introduce the region to a new dimension of luxury, sophistication and service. Led by General Manager Sunny Heng, the team includes: Matthias Y. Sutter, Hotel Manager; Mitsuru Itabashi, Director of Food and Beverage; Tom Feng, Executive Assistant Manager in charge of Human Resources; Richard Chan, Director of Finance; Andreas Lorenz, Director of Kitchens; Anny Tan, Director of Sales and Marketing; Cathy Li, Director of Rooms; Jean Wei, Director of Revenue Management; and Daniel Zhou, Director of Engineering. With a collective expertise that is unparalleled in the luxury hospitality industry, the new executive team is uniquely skilled to launch the St. Regis Sanya Yalong Bay Resort to the forefront of other hotels and resorts in the area. A veteran hotelier with more than 30 years experience, Sunny Heng is well-versed in the Starwood brand of superior service and commitment to guest comfort. He comes to the St. Regis after several years as Complex General Manager at The Westin Tianjin and Sheraton Tianjin Hotel. Mr. Heng began with Starwood Hotels and Resorts in 1991 as Director of Food and Beverage at the Sheraton Langkawi Beach Resort. Born in Malaysia, Mr. Heng received his degree in Business Management at Australia’s prestigious Bond University. Supporting Mr. Heng will be Hotel Manager Matthias Y. Sutter, who comes with years of experience gained with luxury hotels such as the Peninsula Group and Hyatt International (Park and Grand Hyatt) , the world’s most highly regarded luxury Hotel brands. Mr. Sutter was most recently at The Peninsula Tokyo and, before that, the Executive Assistant Manager at the Capella in Singapore. Mr. Sutter received a Master’s Degree in Hotel Management from the prestigious Zürich Belvoirpark and a Master’s Degree in Economics from the Lorange University of Zürich. Mitsuru Itabashi will serve as Director of Food and Beverage. The Japanese native comes from a highly regarded restaurant family with more than 100 years in the business. Before joining the St. Regis team, Mr. Itabashi was Director of Food and Beverage at Four Points by Sheraton Shenzhen, while, at the same time, providing direction for several Starwood Food and Beverage projects including W Retreat & Spa Maldives, Sheraton Tokyo Bay Hotel and Sheraton Incheon Hotel. Previous to that, he helped open W Seoul-Walkerhill, the first W hotel in Asia. He began his Starwood career as an assistant manager at The Westin Stamford and The Westin Plaza Hotels Singapore before moving to the InterContinental Singapore. Tom Feng will serve as Executive Assistant Manager in charge of Human Resources. Mr. Feng brings valuable experience in opening hotels as a member of the pre-opening team for Raffles Tianjin, where he served as Director of Human Resources. Prior to that position, Mr. Feng held a variety of positions at the Sheraton Shanghai Hongqiao Hotel, accumulating rich experience in Food and Beverage Operations and Human Resources. Richard Chan will serve as Director of Finance, bringing more than two decades of experience in finance in the hotel industry, most recently with the five-star properties of the Raffles Group, Hilton Group & IHG Group of hotels and resorts. Andreas Lorenz will be the Director of Kitchens. In this position he will be responsible for menu design, food promotion and presentation as well as food hygiene and food safety for The St. Regis Sanya Yalong Bay portfolio of restaurants. An important member of Starwood’s culinary team, Chef Lorenz helped to open The Westin Dublin, Europe’s first Westin, in addition to working in the kitchen operations of other Starwood hotels in Munich and London. where he ran the kitchen of Pascal Proyarts award winning One-O-One Restaurant. His love of travel and exploring international cuisines led him to Guam, where he ran the kitchen of The Westin Resort Guam as Executive Chef and Director of Kitchens. Anny Tan will serve as Director of Sales and Marketing. Her responsibilities will focus on all domestic and international sales and marketing responsibilities, as well as business development. She brings with her a strong background and impressive track record with Shangri-la Hotels & Resorts group. For the past 8 years, Anny worked in the Middle East, where luxury and sophistication are predominant in the culture. With her vast international experience and strong background in hospitality and, more precisely, Sales & Marketing, she is ready to lead her team and position the St. Regis as the region’s luxury market leader. Cathy Li has been appointed as the Director of Rooms, and will be responsible for the pre-opening development of the Rooms Department, Front Office, Housekeeping, Concierge/Transportation, Guest Relations, Spa/Fitness Center, Telecommunications and Business Center. 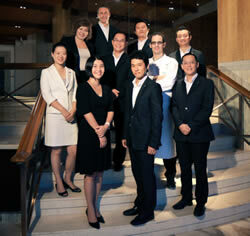 A Starwood veteran, Ms. Li has been a member of The St. Regis Sanya Yalong Bay Resort pre-opening team since April, 2011. Prior to this, Ms. Li accumulated rich experience at the Westin Tianjin Hotel’s Rooms Division Operations. Jean Wei will bring her extensive revenue management experience at other Starwood hotels throughout Asia to serve as the Director of Revenue Management. The Taiwan native comes to The St. Regis Sanya Yalong Bay Resort from Sheraton and Westin hotels in Tianjin, where she was the Complex Director, managing revenue systems. Ms. Wei launched her Starwood career as the Revenue Manager at Sheraton Xiamen Hotel, before moving on to serve as the Director of Revenue Management for The Westin Guangzhou. She received her degree in hospitality management from the prestigious Ecole H?telière in Lausanne, Switzerland. Daniel Zhou will be the Director of Engineering, ensuring that all functions of the resort’s buildings operate smoothly and offer the utmost comfort, safety and convenience for guests. Another Starwood veteran and an experienced engineer, Mr. Zhou has worked as an engineer involved in the pre-opening and opening of several hotels and resorts since 1985.